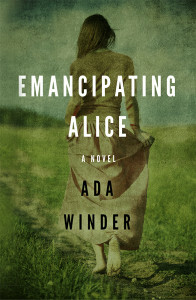 Emancipating Alice: Second Edition is finally here! Goodness! I have been promising this for over a year. The second edition was also meant to be the anniversary edition (to be published November 2013), but I just never got around to the edits, finding myself busy with tons of other projects. Anyway, if you’ve read/downloaded the first edition, look out for an email from Amazon about an update, which I’m hoping they’ll send (if you got it from elsewhere, the new edition won’t be published until October since I’ve made the e-book exclusive to Amazon for a few months). Or contact me; I’ll send it to you. Emancipating Alice is so much cleaner now after having gone through several additional editors since its first publication. It feels great to finally be done with it; I can’t imagine going back to it again when there are so many new ideas and projects on the horizon! I feel like this post should be titled Emancipating Ada because I love this book, but I feel so free now; I did my duty. This must be what it feels like when parents send their kids off to college. Go forth into the world, my love! I have truly done my best with you at this point.